Fresh herbs are the true key to any great dish. They are very special ingredients that all chefs hold dear to our hearts. In my restaurant kitchens we have at least 15 different fresh herbs on hand at all times. For cooking at home, I have pots of herbs in my backyard and I’ll go out and snip a little freshness to either finish a salad or start an amazing reduction. 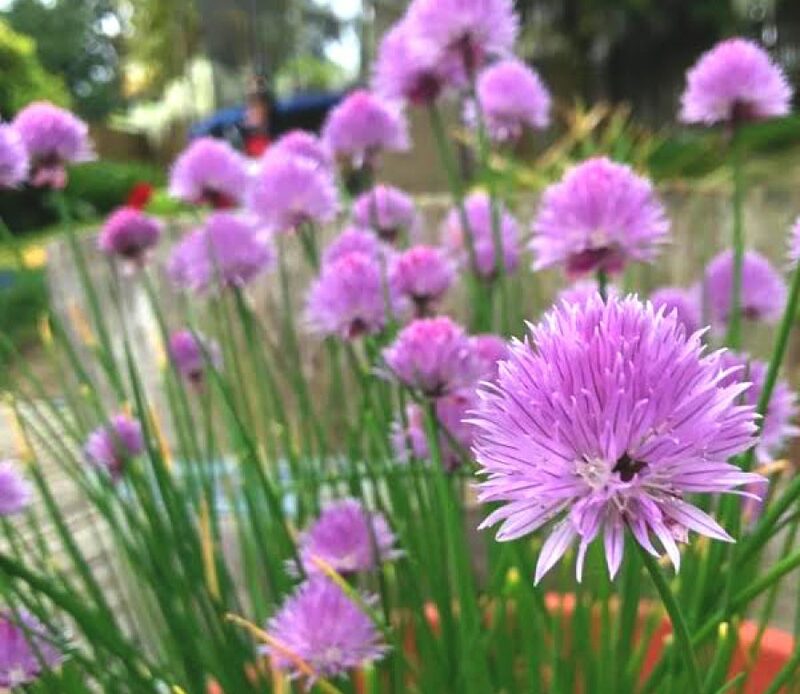 Herbs also have remarkable health benefits like in Kathy’s Blog this Month, Herb Garden Cheerleader. Note: I like to rough chop my herbs for pesto so you have a thick and chunky pesto instead of the pureed style. This gives you POP of flavors when eating. Get a big cutting board and place a wet towel underneath to hold in place. Cut the basil into strips and then set at the top of the cutting board. Chop the parsley and set with the basil. Mince the garlic and put it with basil and parsley. Chop the nuts and then add everything together and place back in the center of the cutting board. Add Parmesan cheese and drizzle in half the olive oil and start chopping to incorporate all the ingredients. Add remaining oil and chop and then finish with salt to taste. Chef’s Tip: you can replace the nuts with any nut you like and do the same with the cheese as long as it is a hard cheese. Note: A chunky herb mix usually used for lamb. Goes great in salads or on chicken or fish. One of my “chef tricks” is poaching garlic in milk. (The milk pulls out the acidity of the garlic and makes it gentle on your pallet.) Place enough cold milk in a pan to barely cover your peeled garlic, let it come to a boil then strain and rinse until clean. Slice garlic and set in side bowl. Chop herbs separately and then place in side bowl. Add herbs and garlic together and chop while adding lemon zest from two lemons and the juice of one. Add salt, pepper, and olive oil. Chop and serve. Note: this spicy condiment has a nice kick with a balance of acidity. Place all items except olive oil and salt into a blender. Puree while drizzling in olive oil. Finish with salt to taste.